In a news release, the UN agency said that Azerbaijan, Iran, Russia, Kazakhstan and Turkmenistan had reached a crucial milestone by adopting and signing one more protocol to the Framework Convention for the Protection of the Marine Environment of the Caspian Sea, also known as the Tehran Convention: the Protocol for the Protection of the Caspian Sea against Pollution from Land-based Sources and Activities (LBSA Protocol). “The signing of the LBSA Protocol in Moscow is an important step forward in the process as it addresses one of the major ecological threats to the Caspian environment and aims to safeguard coasts and waters from the detrimental effects of pollution from land-based sources such as agriculture, industry and urban settlements,” UNEP stated. Ministers and high-level government representatives from the five countries had met in the Russian capital of Moscow for the Fourth Meeting of the Convention's Conference of the Parties (COP4) from 10-12 December. Hosted by the Russian Government, COP4 was also attended by representatives from the European Union, the UN Food and Agriculture Organization (FAO), the UN Development Programme (UNDP), in addition to UNEP, as well as other international observers. “This remarkable progress follows the 2011 adoption and signing of the Aktau Protocol on Regional Preparedness, Response and Cooperation in Combating Oil Pollution Incidents, at COP3 in Kazakhstan,” UNEP said. The UN agency noted that the Caspian environmental process, supported for many years by the world body and others, led to the signing of the landmark Tehran Convention in 2003 and its entry into force in August 2006, and for which UNEP provides the Secretariat. 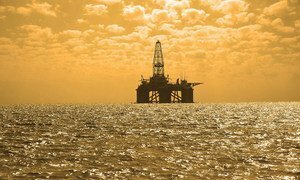 It added that the legally-binding agreement resulted in increasing cooperation amongst the five Caspian nations and comes at a crucial time when the Caspian region is witnessing unprecedented growth in oil and gas exploration, exploitation and transportation. In the area of cooperation in addressing common environmental challenges, UNEP said that COP4 laid the groundwork for implementing a sound environmental monitoring and reporting programme in the region, providing for harmonized and regular information and data exchange between the countries. “Environmental cooperation is an essential basis for the overall economic and social development of the region, a crucial first step on the road to a green economy, equitable management of resources, and a sustainable future for all Caspian states,” said UNEP's Executive Director, Achim Steiner, on the progress achieved by the Caspian nations throughout the years, and in particular at COP4. The five countries bordering the Caspian Sea are to introduce an emergency response system to tackle oil pollution in the world’s largest enclosed body of water as well as enhanced monitoring measures under new protocols to a United-Nations backed treaty.